“Temple Run 2,” the sequel to the wildly popular mobile game, is now available for Android and Kindle devices. The app hit the Google Play store and Amazon.com Appstore early Thursday morning. Just like the original “Temple Run,” the new game is also available free — although users can purchase upgrades within the game. 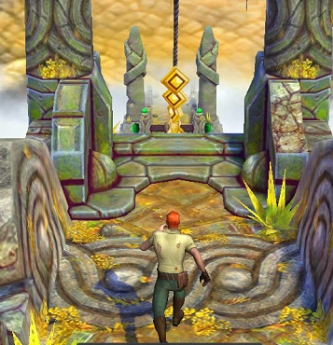 “Temple Run 2” is similar to the original game where users are running through an endless world, trying to survive and achieve the highest score possible. But “Temple Run 2” has better graphics and players can make more moves, such as swing from a rope or ride in a mine cart. If you had any type of affection for the original Temple Run, you’ll dig Temple Run 2—just don’t expect a radically different game. “Temple Run 2” made its debut in the Apple App Store last week for the iPhone, iPad and iPod Touch. The game became the top free app in the Apple App Store within hours of its release and was downloaded more than 20 million times in its first four days.